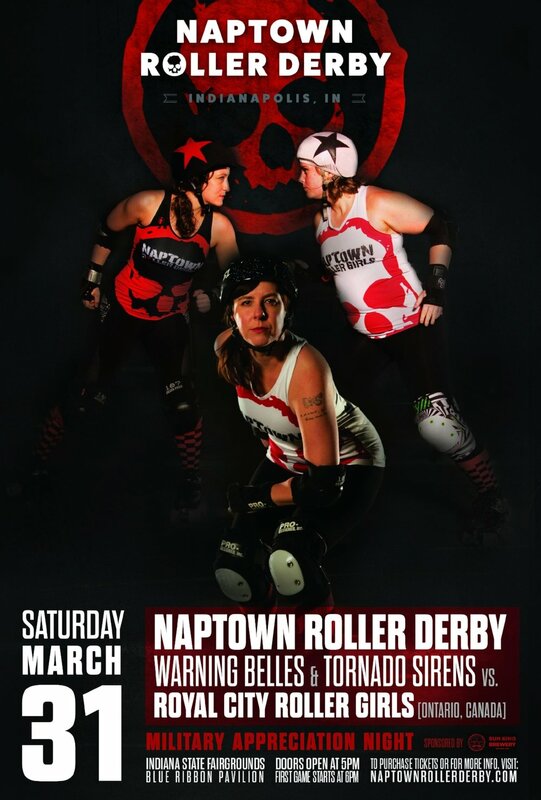 The Tornado Sirens and Warning Belles face off against Royal City Roller Girls from Guelph, Ontario, on Saturday, March 31! We'll be skating in our old home at the Elements Financial Blue Ribbon Pavilion at the Indiana State Fairgrounds, 1202 E 38th St, Indianapolis, IN 46205. Enjoy some excitement off the track at our silent auction! All evening, guests can bid on items from Indianapolis businesses or made by NRD skaters. Proceeds will benefit our future travel expenses. Naptown's charity partner for this event is No Warrior Without Help, an organization that helps veterans access therapeutic services and other assistance. Online ticket sales end at 10:00 p.m. on Friday, March 30. Our community ticket vendors will have pre-sale tickets until approximately 5:00 p.m. the night before the bout.